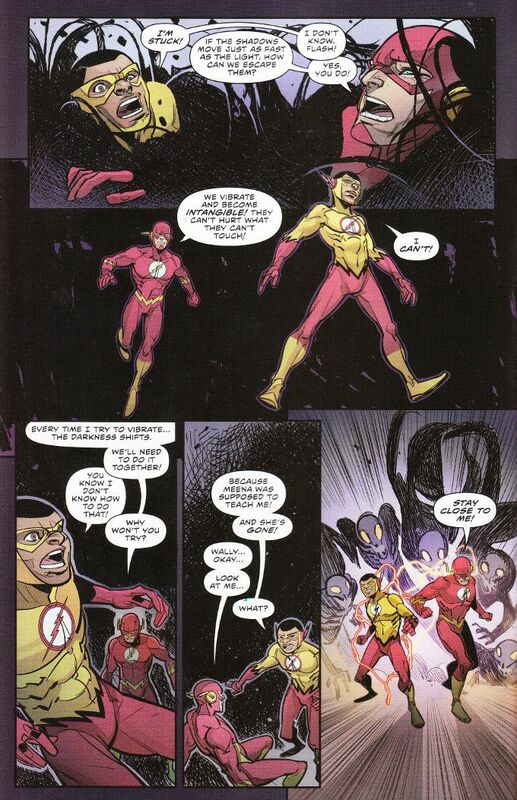 Trapped in The Shadowlands, The Flash and Kid Flash find themselves in even direr straits when the denizens of the realm of fear and nightmare corrupt Iris West and abduct The Shade! The Fastest Man Alive and Fastest Boy Alive will have to reestablish some level of trust and learn some new tricks if they are to prove faster than... The Speed of Dark! As a fan of The Shade and Hope O'Dare from James Robinson's Starman, I'm pleased by Joshua Williamson's take on the characters from that series. I wish we'd had more time with Hope O'Dare when she wasn't playing the shadow-controlled femme fatale but then I'd also love to see a series devoted to Shade and Hope traveling the world together. Still, the Shade/Hope relationship proves an interesting counterpoint to the Flash/Iris one and I'm anxious to see where that goes. Particularly since Barry doesn't seem all that concerned about the missing Dr. Meena anymore! The artwork remains as impressive as in the earlier chapters. This issue featured two colorists, but you'd never know it the way Ivan Plascencia and Christopher Sotomayor match one another's work. Again, I must note the novel touch of using purples instead of blues and blacks to mark the shadows, giving Davide Gianfelice's artwork a brighter, more dynamic appearance than one would expect in a story set in The Shadowlands.